The new facility provides sales and engineering resources as well as training. Local dignitaries and Stäubli executives commemorate the opening. NOVI, Mich. - Sept. 11, 2018 - PRLog -- Stäubli is announcing the grand opening of its fourth site in North America, a training facility and service center, in Novi, Michigan. 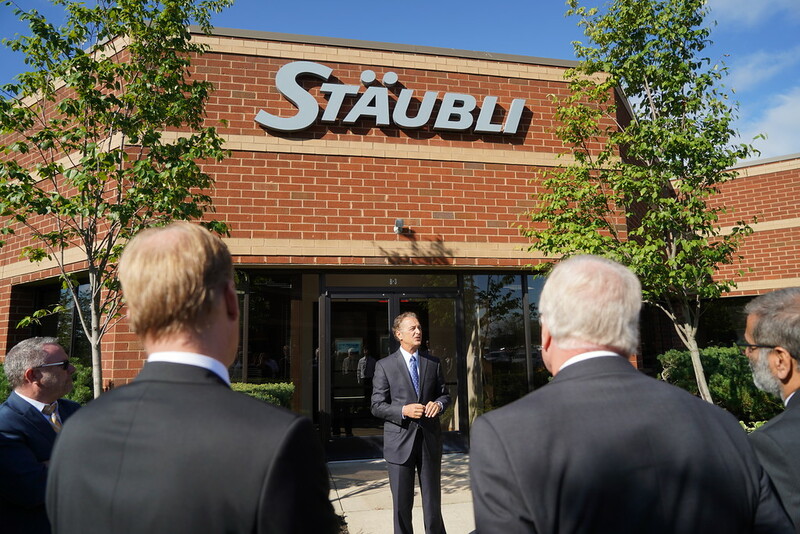 The company held a ribbon-cutting ceremony on Sept. 11 to officially open the new facility, which also will serve as a sales, service and engineering center for Stäubli's robotic, fluid connector and electrical connector customers. The 5,000-square-foot facility will provide support for Stäubli customers in all industrial sectors and will have a special focus on the automotive industry. The center's key function will be to provide Stäubli customers across the region sales and engineering resources and to serve as a training facility for Stäubli partners on how to better integrate the company's innovative solutions in robotics, electrical connectors and fluid connectors into their existing operations. Other North American sites include the company's North American headquarters in Duncan, South Carolina, Stäubli Electrical Connectors' headquarters in Windsor, California, and a sales and service facility in Querétaro, Mexico. "Novi provides Stäubli with a perfect location, right in the heart of one of America's great, industrial states and a hotbed for automotive production, which has experienced tremendous growth over the past few years," said Roger Varin, CEO of Stäubli North America. "The people of Novi have been incredibly welcoming, and we are grateful to have worked with the community to make this center a reality for our customers, both current and future." Stäubli's new site will support customers on the best ways to integrate Stäubli robots into their current production processes and also provide training on how to program robots to meet their specific needs. As a leading pioneer in the development of robotic tool changing systems, Stäubli Fluid Connectors also will use the facility to showcase the many ways its multi-tool changer can benefit the automotive sector along with other industries. "With the automatic tool changer, a robot's capabilities can be significantly expanded and their productivity and efficiency can be exponentially increased," said Phil Briggs, Fluid Connectors Division Manager, Stäubli North America. "Although they are ideal for applications in the automotive industry, the prospect of increased efficiency make our tool changers attractive for other markets as well." Stäubli recently introduced its TX2 line, an Industry 4.0-enabled line of collaborative robots that represents a new generation designed with the smart factory and Industry 4.0 in mind. These interconnected robots enable machine-to-machine communication and the exchange of data between devices. Stäubli robots are capable of relaying production data to computer systems upstream of the production chain and lay the foundation for a networked production process that's connected to the digital world. One of Stäubli's core Industry 4.0 offerings for the automotive industry incorporates both fluid and electrical connectors as well as robotics. Stäubli's Quick Mold Change (QMC) system has revolutionized the plastics industry, streamlining every stage of the mold change process. The company's QMC solution features a Single-Minute Exchange of Die (SMED), allowing injection molds to be performed to the highest safety standards within minutes. Stäubli's experience in robotics, sensors, magnetic clamping, rapid connection devices, tool changers, trolleys and electrical connections enables its QMC system to work quickly and safely. A unique range of integrated, Industry 4.0-connected solutions for injection molding save plastic processing companies precious minutes every time a mold is changed. Integrated sensors detect the condition of the mold, the molding force of the magnetic clamping system and a variety of other factors and feed that data into the process. Any faults, like a failure to reach the correct operating temperature, will be recognized early so the fault can be corrected, maximizing efficiency and safety. Stäubli entered the U.S. textiles market in 1953 and was represented by H.J. Theiler Corp., which had operations in Spartanburg, South Carolina. Stäubli Corporation, the North American division of Stäubli, was created in 1979. In the 1980s Stäubli began collaborating with the world's first robotics company, Unimation, which was launched in Danbury, Connecticut, in 1962. In 1989 Stäubli acquired Unimation and has been an industry leader in robotics ever since. Today, the company's North American headquarters are located in Duncan. The 100,000 square-foot facility is built on 16 acres of property located in upstate South Carolina, between Greenville and Spartanburg. That facility focuses on fluid connectors, robotics and textile machinery. Stäubli's standard and specialized fluid connectors combine performance, quality, safety and durability with a variety of seal types, coupling materials and design options, which make them compatible with a wide range of coolants and temperatures. Stäubli acquired its electrical connectors division, Multi-Contact USA, in 2002, changing the name to Stäubli Electrical Connectors in 2017. Headquartered in Windsor, California, the division's proprietary MULTILAM technology features specially formed and resilient contact elements that create a superior electrical connection. It has set the industry standard for safety and performance in a variety of industries including test & measurement, photovoltaics and alternative energies, the automotive sector and more. Stäubli North America has over 240 employees supporting Textiles, Connectors and Robotics customers. The company's North American headquarters is located in Duncan, S.C., and the sales force is strategically placed on the West Coast, Canada, Mexico and elsewhere throughout the continent. Stäubli Electrical Connectors – North America's headquarters is located in Windsor, California. Its product range includes interconnection systems for the most demanding applications in aerospace, medical, robotics, solar energy, general industry and test & measurement including plugs and sockets designed for high performance, high mating cycles, low insertion and extraction forces, and that are ideally suited for low- and high-current applications. Stäubli serves customers worldwide who aim to increase their industrial productivity without compromising quality, reliability or safety.